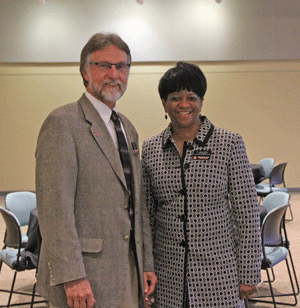 Nearly one month into their new positions at Cowley College, Dr. Gloria Walker and Dr. Harold Arnett were honored during a Vice President’s reception Tuesday, September 29th in the Earle N. Wright Community Room. Dr. Walker serves as the vice president of finance and administration, while Dr. Harold Arnett is the school’s vice president of academic affairs. The reception was an opportunity for members of the college and community to become personally acquainted with two newly hired senior executives of the college, who will oversee well over 75 percent of all full and part-time employees at the college. “The college is fortunate to have these highly skilled and trustworthy leaders, who will help us shape and create a rich environment conducive to student success,” Cowley College president Dr. Dennis Rittle said. Dr. Walker said she has been impressed with the direction and leadership of Dr. Rittle and the Board of Trustees. Dr. Arnett said the reception was truly an honor and he enjoyed meeting people from the community that conveyed a sense of interest in the college. “On the whole, it was a really great afternoon/evening and a very special memory,” Dr. Arnett said. The number and nature of positive comments Dr. Arnett has had welcoming him to Cowley has been overwhelming. That future seems even brighter with the arrival of Dr. Walker and Dr. Arnett. “Words cannot adequately express how blessed we are to have Dr. Arnett and Dr. Walker leading the areas of academics and finance/administration,” Dr. Rittle said.